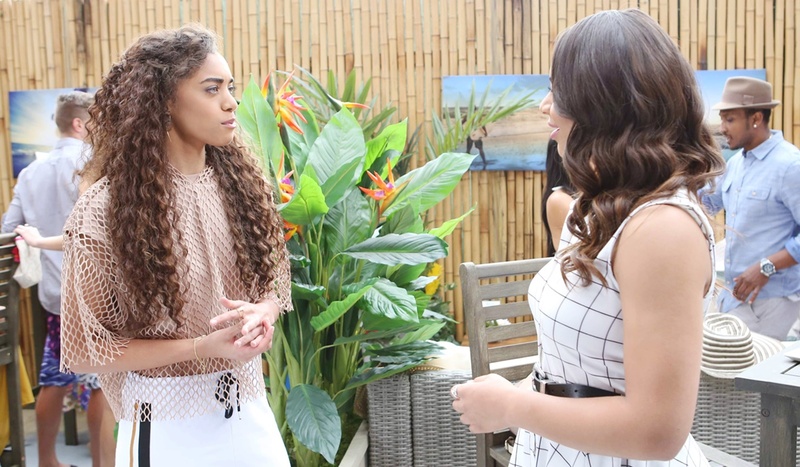 Wednesday July 11, 2018: Zoe purposely bumps into Emma, Maya and Julius question Xander, and Thorne and Katie accuse Sally of threatening Hope. 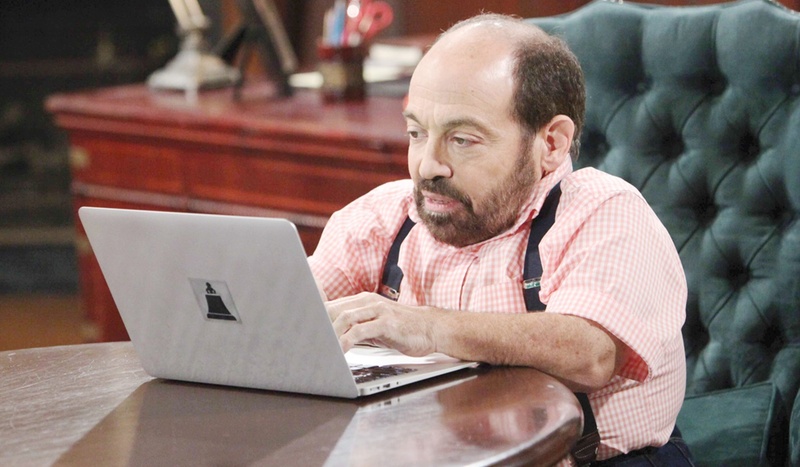 At Forrester Creations, Ken checks out the comments about Hope and tells Katie he’d stalk her before he’d stalk her niece. Katie, frowning, replies, “Um…thank you?” Ken hacks into the website, while Thorne presses to find out how long it will take. Ken chirps that he’ll be a couple of hours and dispatches Thorne to get him lunch from Café Russe. After eating lunch, Ken reveals that he had the answer hours ago – Sally Spectra is behind the negative comments toward Hope, but she didn’t make the posts from there. Katie gapes as Thorne thanks Ken and sees him off. Katie wonders where Thorne dug him up. 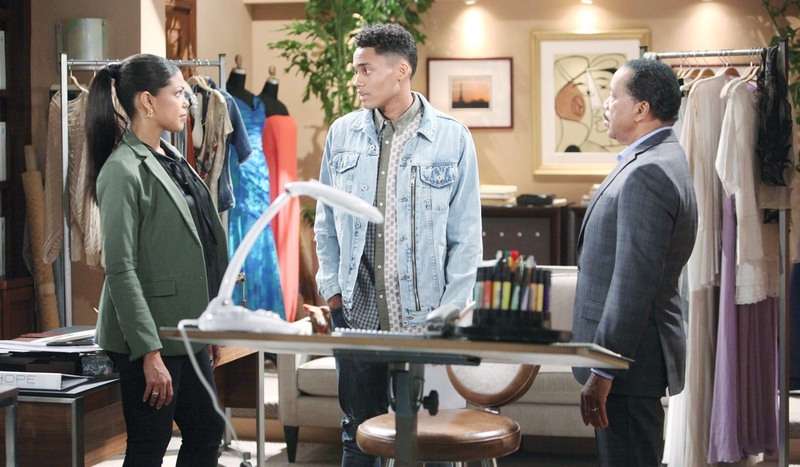 In the design office, Maya tells Julius she thinks Xander may be hiding something as he has a fake social security number with payroll. At Café Russe, Xander makes Emma laugh as Zoe looks on in consternation. Xander takes a call from Maya, summoning him back to work. He leaves Emma his card to pay with, and takes off. After, Zoe deliberately bumps into Emma and spills on her, then makes nice. Emma tells her she loves her accent – she talks like her boyfriend. Emma then clarifies that it’s a new relationship; they’re not really anything yet. Zoe flashes to finding Xander’s note that he’d moved out of their apartment, before telling Emma she’s certain she’ll see her again. Emma leaves, and Zoe thinks of making love with Xander, then of Xander kissing Emma. In the beach house, Wyatt and Sally lay naked under blankets on the couch as they discuss the wisdom of having given Zoe a key, and debate whether she’d steal. They kiss and canoodle before rehashing Sally’s issues with Hope. Wyatt counsels that she’s undergoing an initiation, and if she handles it with charm, they’ll come to love her. Sally takes a call from Thorne asking her to come in. Thinking he may want her to design she excitedly rushes out. In the Forrester Creations design office, Xander answers Maya’s questions and reveals he told Emma about his British background. Maya warns about giving out too much personal information. Xander reveals his secrecy is due to his ex-girlfriend in London – he’d rather not be ‘findable’ for now. Julius isn’t overly concerned, but Xander explains that she wasn’t happy when he broke things off; she was a little too attached. Julius wonders if that’s why he came to L.A. Xander admits she became obsessive after the break-up; he hopes she’s moved on. In the boardroom, Sally’s brought sketches with her, but Katie and Thorne accuse her of making veiled threats against Hope on the website. Sally denies making the posts and offers up her laptop. Katie asks if it wasn’t her, who was it? Steffy and Hope both decide they’ll fight for Liam.